Mathew Colgan was the youngest son of James and Ellen Colgan. Mathew Colgan was born on 5th July 1891 in Tobermore, County Londonderry. His father was a farm labourer in Tobermore. Matthew Colgan served with the Royal Inniskilling Fusiliers for three years. 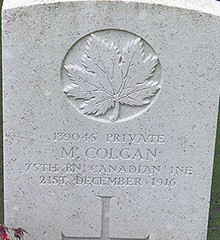 About 1912, Matthew Colgan moved to live in Toronto, Canada. Matthew was employed by the city of Toronto as a labourer before he enlisted. He was living 121 Shaw Street along with his brother David. 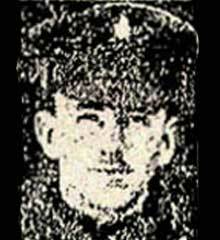 Private Matthew Colgan was serving with 75th Battalion of the Canadian Infantry when he died as the result of shell wounds at No. 11 Canadian Field Ambulance on the eve of Christmas on 21st December 1916. Souchez is a village 3.5 kilometres north of Arras on the main road to Bethune. The cemetery is about 1.5 kilometres south of the village on the west side of the D937 Arras-Bethune Road.